Bali Cruise Tour is an adventure tour boarding a cruise and enjoy the programs provided, this tour is very popular among tourists and certainly very full of memories. This tour you should try to fill in vacation days and on the island of Bali. The cruise package that we offer nothing for a full day of activities on the island lembongan and no special package to enjoy dinner on the cruise with sunset views. Here we are working with cruise companies already well-known and proven quality in providing services to the guests. Cruise ships used to use advanced technology and attractive design that will make the atmosphere to be safe and comfortable. Bali Sunset Dinner Cruise Tour is a program Bali Cruise Tour to enjoy dinner adventure on a luxury cruise ship with sunset views that will make the atmosphere more romantic dinner. 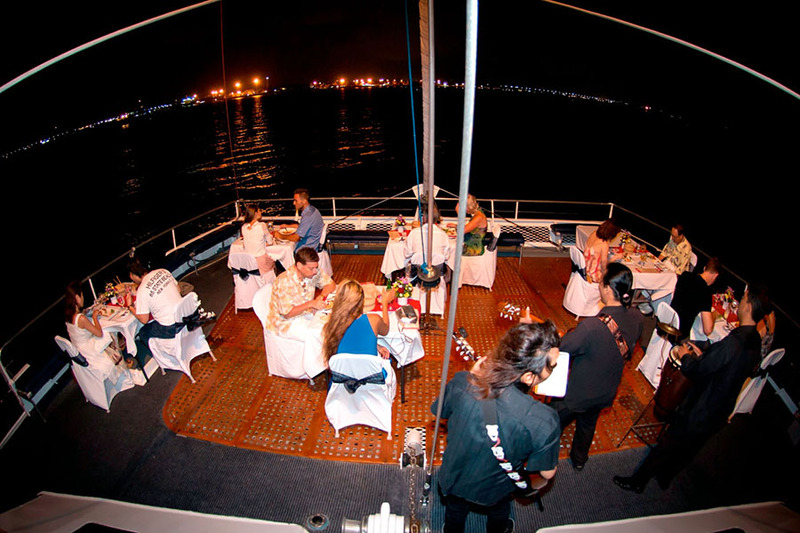 At sunset a vessel will depart with a relaxed pace to get to around the harbor, while the dinner you will be entertained by live music entertainer there is no better way to spend a comfortable tropical night of the Bali Hai evening Dinner Cruise. At sunset we set off on a leisurely cruise around the harbor. Taking in the cool night air on the upper deck, be entertained by live music entertainers in the bridge deck, enjoy an international buffet dinner was delicious, then dance the night away in our disco or enjoy our live cabaret show.